Amy Lawton, a fellow member of QMUL, joins us as part of the Coffee House Sessions Tour. Amy spoke with us at CUB before her performance at the Griff Inn on Friday 5th October to give us an insight into her music career so far. Hi Amy, how are you and how are you finding the Coffee House Session Tour so far? It’s going really well so far. This is my fifth day – I have been to Bournemouth, The Royal Holloway, which was really nice, Warwick, which was really cool. Now being in London is so nice because this is actually my university. It’s really nice to be home, and I even got to go to one of my lectures this morning! How are you looking forward to playing to a home audience? I’m excited because there are hopefully going to be people here that I recognise. But, also, it’s been really great to play to new audiences and reach students that I wouldn’t normally get to. How would you describe your sound for those who haven’t heard you yet? I find it really hard to put my music into a genre, but if I had to try and help someone understand I would probably say I’m inspired by a lot of country music. It’s definitely got a country twang. I would also say it’s a little bit folk-y and a little pop-y. You have been compared to an early Taylor Swift. How do you feel about that comparison? I love Taylor Swift, so that’s a really nice compliment. I’m not sure I can be her though to be honest. Do you think you will ever move on from the country genre as Swift did? Umm.. I’m not sure because obviously Taylor Swift went from country to pop, but I don’t think that what I’m doing is quite so country so I don’t think there would be such a dramatic shift. I’ve already got some pop in there already. I guess the more I write songs, the more I think about pop structures, but I don’t know if you’d see that dramatic shift. Your singles, Hurts Like Paradise and Undone appear to have quite personalised stories behind them. Are they based on personal experience? Definitely. All of my songs are pretty much based on my personal experience and life. It sounds quite twisted but Undone is kind of about toying with someone’s emotions, and a lot of my songs are about my real life relationships. I think if you listen to my songs, the lyrics are not difficult to work out – they’re very to the point. I write the music and lyrics. I write them by myself and some I I co-write with Matti, a producer who has been developing me for three years. ‘Undone’ we wrote together. I wrote ‘Hurts Like Paradise’ by myself when I was about 15. But then I’ve basically played it at every gig that I’ve ever done, and it’s always just been one of the favourites, so I decided to put it out. Which tends to come first, the lyrics of the music? Ummm.. it’s a hard question. They both kind of come together. It happens in different ways. Sometimes I’ll think of a bit of lyric that I’ll write down and then other times I’ll just be sitting in my car and just come up with something and I’ll write lyrics to go with it. It just comes down to what I think of first, it’s never the same. How would you compare the music scenes of London, and your hometown of Manchester? I haven’t played a lot in Manchester, but I do know that London is really tough. There’s so much going on here that you really have to fight for people’s attention. I wrote a song called Loneliest place in the World when I first moved to London, which will hopefully be out soon, but it’s about how London can be quite cold sometimes. But that’s sort of why I like it so much. It’s sort of like a challenge to make it here. What has been the most enjoyable part and the most challenging part of your career so far? The most enjoyably part is the music itself. Writing songs, and the luxury of going to the studio whenever I want and get a song down, when I used to wonder if I would ever get to hear one of my songs actually recorded. The gigging is of course loads of fun. Probably the most challenging part is the business, industry side. It’s all about numbers and having to promote yourself. What advice for others wanting to get into the music industry today? My advice would be to use social media as your own platform; you don’t need as much help as you did before social media. Also, just not to worry about what anyone else is doing creatively. The most important thing is to be convincing that it is your own work. How do you feel as your music is being released on such widely accessed platforms like Spotify and Deezer? It’s really scary. Sometimes I’ll have a song that I’ll have written and I’ll be so excited to put it out and then the second that it is out and I see that it is on itunes suddenly I just question everything. It’s scary because it goes from being something that is yours to something that is everyone’s. Suddenly everyone can have their own say about it. If you could be told that one person in the world, dead or alive, loved your music, who would it be? I would really love it if Suzanne Vega listened to my music. Is there anything that you would like our readers to look out for in the coming future? Hurts Like Paradise, that I will be playing on this tour, is out now. Also I’m hoping to release the next single, which is going to be a song called Don’t Bring Louise. If you follow my social media, which is @amylawtonmusic you can find out when it comes out. 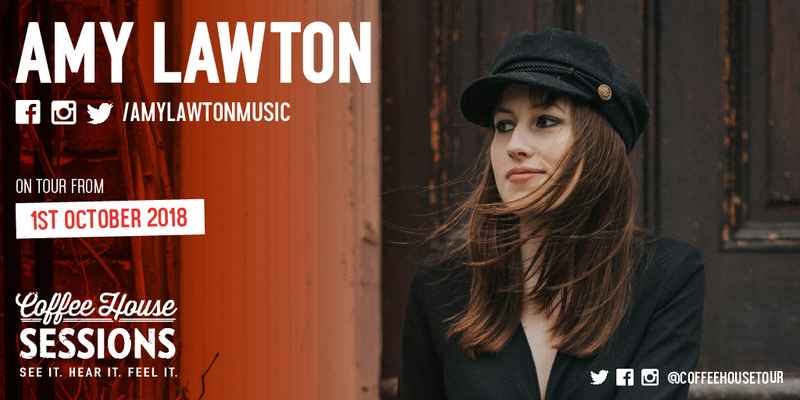 Be sure to check out Amy Lawton on your music platform of choice, and follow her social media to keep up to date. Coffee House Sessions will be taking place every Friday afternoon at the Griff Inn in Whitechapel. Come down next week for a live performance from another fantastic up-and-coming artist!